NASA’s Parker Solar Probe -- named after Eugene Parker, the physicist who first introduced the theory of solar wind -- is out in space on a one-of-a-kind mission: to get up close and personal with the sun. While its mission is far from complete, it’s accomplished some major feats, like snapping an incredible new photo of the blazing-hot star. Parker spent 12 days in October and November soaring through the corona, the ultra-hot atmosphere surrounding the sun, during which it managed to take advantage of a photo opportunity. The spacecraft sent back an image basically taken inside the sun -- the first of its kind. The picture may not look like much to the untrained eye, but scientists and space buffs alike are celebrating the accomplishment. 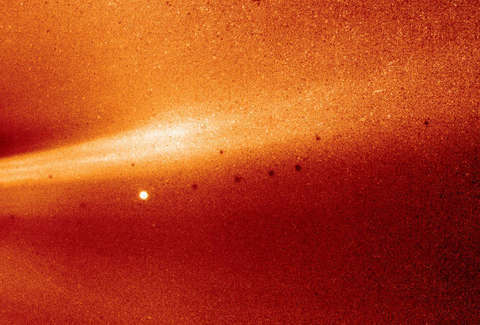 Parker captured the image using its Wide-field Imager for Solar Probe (WISPR) while it was about 16.9 million miles away from the sun. According to NASA, there’s a lot to be seen in the picture, though it looks like one you might accidentally take inside your pocket or something. 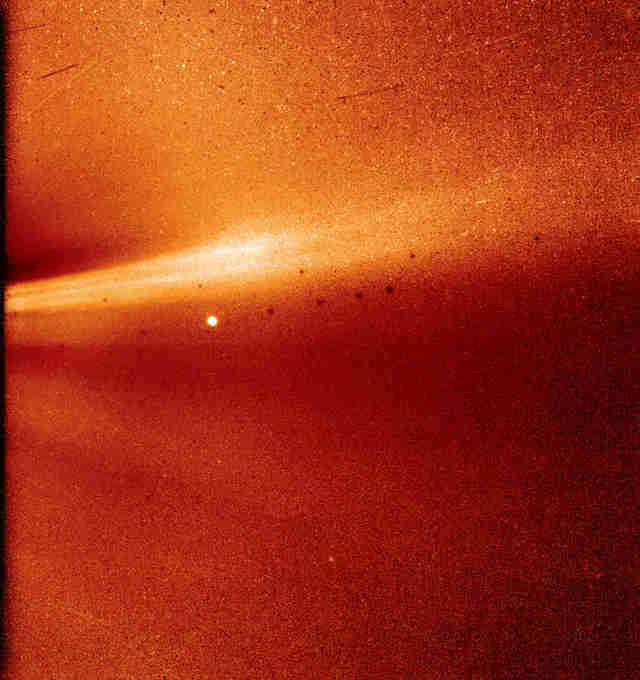 Two jets of solar material, known to scientists as coronal streamers, are visible in the left portion of the snapshot. The bright spot off in the distance is Mercury, and the black spots are caused by background correction. NASA released the image in a press conference during which scientists revealed everything they hope to learn from the probe. Data from Parker began rolling in on December 7, but the space program won’t have everything they need until Parker’s second flyby in April 2019. Patience has been paramount in this mission. Parker is just four months old and has been busy up in space. In addition to snapping the first-ever image from inside the sun’s atmosphere, it crushed two long-standing records for getting the closest to the sun and the fastest spacecraft in history. The latter record will come in handy, as NASA’s hoping that in time Parker will be able to match the speed of the sun as it orbits over the same region of the plasma-covered sphere collecting data. Parker is examining the sun’s electromagnetic fields, ions, and energetic particles. Its mission is set to continue until 2025… you know, provided it doesn’t fly too close in the meantime.